Tomorrow (Monday) a significant wind event is forecast to hit the region by the U.S. models.. But there is some uncertainty because some models (e.g., the European Center) are moving the low farther offshore. The 1 PM Sunday visible satellite imagery shows the incipient storm, nearly due west of the CA/OR border. Can you see the swirl of clouds around the low and the very unstable air (with popcorn-looking clouds) to the storm's west? The latest WRF run (forced by the US GFS model) shows the forecast sea level pressures (solid lines) at 4 PM Sunday. A 995 hPa central pressure. By 10 AM, Monday morning, the system has revved up as a double-barrel low, with an intense pressure gradient (change of pressure with distance) along the Washington Coast. That will bring very strong winds. 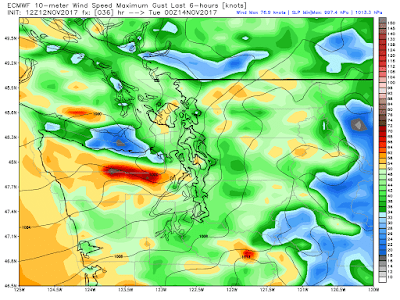 The low pressure sweeps northwestward, bringing a strong north-south pressure gradient over western Washington, which will experience strong winds. Here are the wind gusts forecast by the ultra-high resolution (1.3 km grid spacing) UW WRF system. By 6 AM Monday morning, strong winds have reached the coast (50-60 knots) and over portions of NW Washington. By 11 AM (19 UTC), crazy strong gusts (above 70 knots have reached the SW coast of Washington) as the low center approaches the NW tip of WA. By 1 PM, the low center is over Tatoosh Island and winds over Puget Sound are revving, with gusts to 50 knots over south Seattle and more around the San Juans. The action continues through 3 PM, with the winds starting to back off along the southern WA coast. But what about other models and ensemble (many forecast) products? The NWS SREF ensemble system's forecast of sustained winds at Sea Tac shows that most runs indicate windy conditions, with an average sustained wind of about 20 knots, which would imply gusts to around 25-30 knots. There is considerable uncertainty, with some of the runs with much stronger winds. 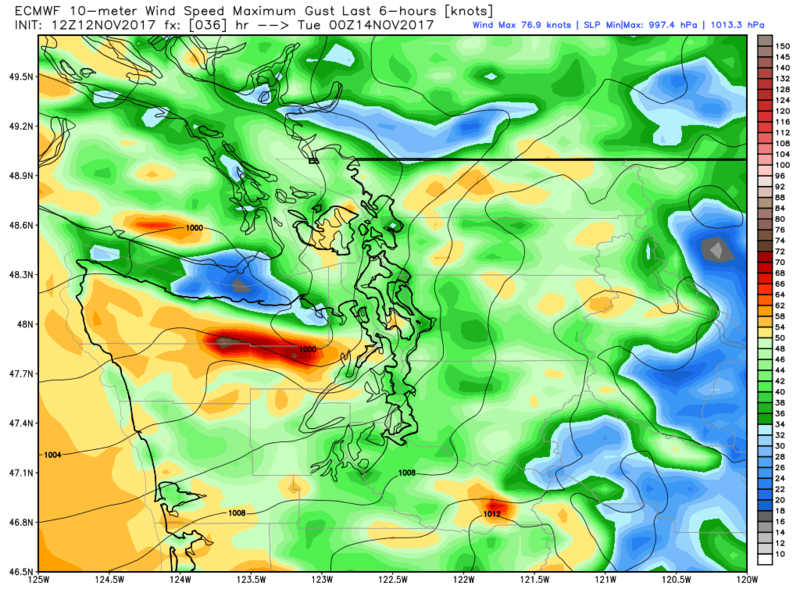 The vaunted European Center model is taking the low farther offshore with the gusts over Puget Sound reaching 40-45 knots, with more over the coast and San Juans (see graphics of pressure and wind gusts below for 4 PM Monday). A forecast of gusts over Seattle of 30-50 mph seems reasonable. Add 20 mph for the San Juans and the coasts. Considering that we are early in the season and lots of leaves are still on the trees, one should expect that thousands of folks will lose power tomorrow. Drove to Seatac this morning from Bellingham at 4:30 am. The rain was pummeling down from Arlington south. Hard to drive in the darkness with rain sheen and occasional highway lights. Huge hydroplaning puddles near overpasses heading north in the commuter of fast lane and all the tire ruts on I-5. Almost impossible to see lane designation heading north on I-5, with a sheet of water and lights fouling up the visuals. High mental focus strain upon return. High winds, if they arrive tomorrow, always makes just a rainy day more interesting. I saw that Weather Forecast Offices back east are starting to use the phrase "bust potential" to characterize the probability of events (in their case heavy snow) NOT occurring. This wind storm seems to have a high "bust potential". I wonder if they are going to characterize it with a probability range. What a wonderful forecast. Things are picking up it seems. I like that term ... "bust potential." 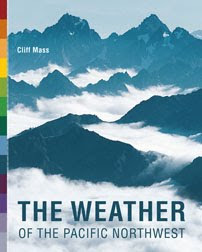 Good, perhaps, to assign a probability percentage of a "main forecast bust" to every forecast. Even if that percentage is small. Why so much talk about knots? Do NW meteorologists think and calculate in knots? Meters per second? Guessing it’s because mariners care more than most about wind, so forcast products target them? Honestly curious. Well, we just had a big wind event in Canyon Park area of Bothell at around 2:30 am Monday morning. It was over in 10 minutes. I panicked because I have no alternate heat source. I jumped on Amazon while the lights flickered and buzzed. 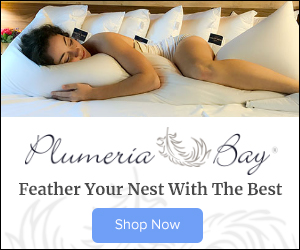 Just had a freak sudden windstorm hit South Whidbey Island, came on with no warning at about 2:30am, seemed like 60 or more miles per hour and stopped just as suddenly. Lasted 1/2 an hour at most. What was that? Heavy squall came through Seattle around 2am. Didn't seem terribly windy, but it rained hard enough to wake me up. The "event" at ~2:30am (depending on where you live) was the pre-storm front passing through. This type of storm is shaped like a comma on the satellite (or was, this morning). The tail of the "comma" is what caused sudden gusts of wind. Higher gusts in certain places than others (Olympia only gusted to ~ 22 - 25mph). 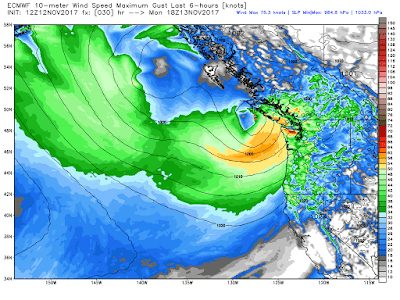 According to the forecast, the "main event" is still going to happen late morning - afternoon for peak gusts 30 - 55mph inland and 50 - 70mph (or so) coast and Northern Interior. Same in NE Seattle. Hard rain and lightening too. Woke me up. Wish I5 would be repaved and restriped to make it smoother and safer. This work is long overdue throughout Seattle.